"It used to take about 60 days before call agents felt confident handling the full spectrum of customer calls. Now, after only 15 days of being hired, new call agents can handle any call. It's awesome. We are so thrilled." The contact center is a BPO (business process outsourcer) for customer support calls. They bring on new clients year-round, which means they are hiring and training new call agents on a regular basis. Their goal is to develop knowledgeable call agents who can provide a great customer experience with little to no hold time. Before ScreenSteps, it would take around 60 days before new call agents felt confident handling the full spectrum of customer calls. We’ve always had three-week training. Two weeks in the classroom and one week on the floor monitored. But we were noticing that agents weren’t confident coming out of training; they really didn’t know what they were doing. And for some of the more involved calls, agents would just shudder because they didn’t want to take those calls––they just didn’t know how to handle them very well. Stephanie noticed that call agents weren't retaining much of what was covered during classroom training. 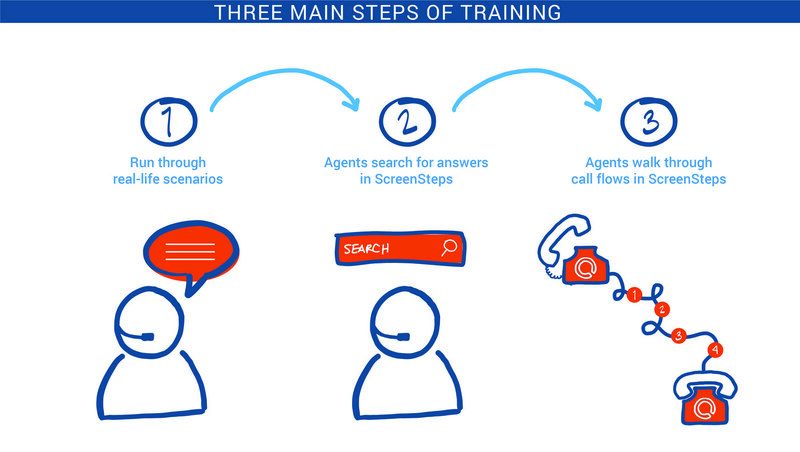 We noticed that after training, agents would get on a call, put it on hold, and then ask the person next to them what to do. We realized that new agents weren’t learning anything in class; they learned everything during on-the-job training. Stephanie's challenge was to make her classroom training more effective so that new agents could hit the floor confident and proficient. When new employees are hired, they have a lot to learn. It's not realistic for them to remember everything they are shown during training. So Stephanie took a different approach. Instead of expecting new agents to memorize everything, she rewrote the procedures and trained new agents how to use them while talking with a customer. ScreenSteps allowed us to format our documentation into call flows, and that has improved our agent metrics across the board because the call flows walk agents through step-by-step what they should do on any type of call. Our agents can search our ScreenSteps knowledge base and find the answer to any call that they get. Now, in training, I’m not focused on getting agents to memorize anything––I’m anti-memorization. The goal is for new agents to be able to find the answers in ScreenSteps and use them appropriately. That’s what I’m training them to do. Stephanie revamped the classroom training to feel more like on-the-job training. Days one and two in the classroom consist of an overview of the systems and how to use ScreenSteps. Then, the training begins. From day 3 to day 10, we pepper the agents with real-life scenarios, ask them to find the answer in ScreenSteps, and then we talk about it. We do a form of nesting in that we start off with easier questions and scenarios, gradually building up to more complicated calls. After classroom training, agents spend 5 days on the floor within arms reach of a supervisor (to make sure they don't break anything). Stephanie has a facilitator’s guide for the training and everything else is in ScreenSteps. If policies change or procedures change, it doesn’t really impact the training approach because that’s all in ScreenSteps. It’s self-contained. A trainer just has to run through the scenarios and the agents search through ScreenSteps to find the appropriate document. Bumping up the "on-the-job" learning to happen in the classroom has prepared agents to hit the floor confident and proficient. It’s the speed to proficiency that’s been really impressive. Before ScreenSteps, we could always get agents where they needed to be––it just took a lot longer. After 45 days of being hired, call agents might be proficient for those basic calls, but for some of the more involved calls, agents would just shudder because agents just didn’t know how to handle them very well. But with ScreenSteps, new agents don’t seem to have any calls that they shudder with. They feel confident handling any type of call within the first 15 days of being hired (even the more involved calls), and by day 45 they are pretty much experts. Handle time is down, talk time is down, hold time is down...the metrics across the board are a lot better than they were previously. Stephanie is an amazing trainer and a fantastic technical writer. ScreenSteps gave her the tools she needed to revamp her new-hire training so that agents could do their job better, and provide an amazing customer experience over the phone.